Chances are, you haven’t heard of The 204. But that’s going to change in the coming years because these Brandonites are making some seriously good music. They’re all geared up to release their debut EP ‘How It Goes’ on December 11th, 2015 and it’s onwards and upwards from there! Filled with harmonies, old school melodies, creative playing, Ben, Keiran, Bryn, and Nick have made something really special. The 5 song EP is a wonderful snapshot of a young band’s life; young love, heartbreak, and great songs. You don’t want to miss this show! I had the pleasure of chatting with all four of the guys, even while Keiran Placetka was busy with Vincent Massey’s Cinderella and the rest with Simple Green, CP Express, and other local music commitments. Alright guys, thanks so much for taking the time to chat. First off, let’s get all the details of your release show! When is it, where is it, who else is playing? Keiran: No problem Liam! 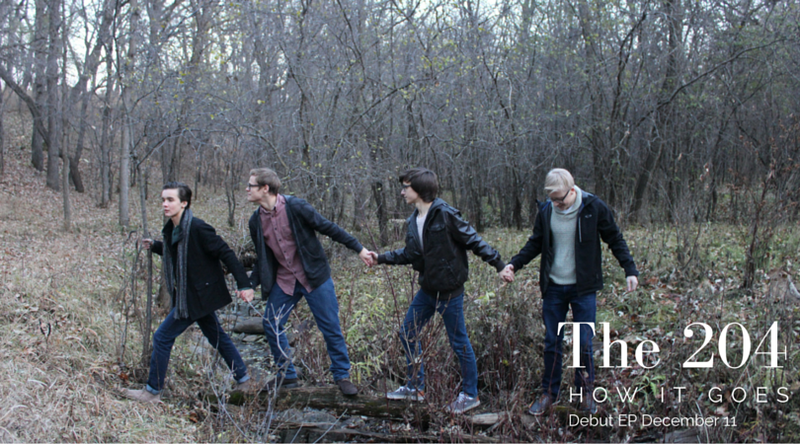 We’re releasing our debut EP ‘How It Goes’ on December 11th, 2015 at the West End Community Centre. Show starts at 730 pm and tickets are $10. The wonderful Hannah Selyn is opening up the show! Right on, classic venue! I’ve seen and played many local shows there. And the EP, how many songs, what’s the vibe? Ben: We’ve got 5 tracks with the common theme being… girls I guess! Bryn: It’s turned into a bit of a snapshot of where we’re at right now, with our playing and songwriting. Girls, a great source of inspiration! Is there a common theme stylistically?? Ben: We’ve got a pop rock sort of sound. Interesting. To me, I hear a 50s vibe mixed with some modern influences. I think it’s the old school melodies and harmonies that give it that 50s flair. Is this something you were intentionally going for? Keiran: I don’t think so. You’re not the first person to say that, and I think it’s just something that crept in. It wasn’t overly intentional, it was more or less just a combination of our combined influences. Okay, so talk to me about the influences that lead to this sound. Nick: I really loves Kings Of Leon, Red Hot Chili Peppers. How does this affect your drumming? Nick: I have classic rock as my main influence for drumming, but I love groove/part based drumming and try to incorporate that into my playing. Bryn: I grew up jamming with my Dad to stuff we heard on KX96. So mostly classic rock. My brother Keegan introduced me to indie music which has inspired me to play bass a little outside the box. I like to lay it down but do a bit more than just meat and potatoes. Keiran: I listen to a lot of pop rock with big harmonies, like Said The Whale, however I come from a strong classical and jazz background. I also like Elton John and Billy Joel. In this band I try to create melodies with my parts, that are a little outside the box. Ben: Lately I’ve been really into the Blues, like John Mayer Trio or BB King. And of course Brandon’s own Dylan Macdonald. Great, thanks guys. Have you written anything new since you made these recordings? Ben: We have almost another full EP worth of new tunes! Keiran: At the release we’ll be debuting our brand new stuff, and we’ll also be releasing some new live videos! And how have the new songs turned out? Similar style or are things still evolving? Keiran: Things are changing I think! We are getting less ‘Pop’, using some more interesting progression and more exciting forms. bryn: I would say we’re still trying to find our real ‘sound’. These songs are pretty close! The evolving never stops! I will definitely say that your EP is a mixed bag. From the 50s-esque September, to indie-rock Colder Than We Knew, the style moves around. Why do you think this is? Keiran: I think it’s just our different influences. It also depends on who wrote the song. Okay, well how do you guys write? Talk to me about the process. ben: I write the majority of the songs. It’s typically derived from my experiences with, well, girls. It’s pretty straightforward writing. Then I bring it to the guys to work on! Keiran: We like to write simple, honest lyrics. We don’t write anything too poetic, but it’s always truthful. So Ben, do you have the most dramatic love life? ben: Yes, I would say so! I have the most successful love life anyways! Keiran: I have the least successful. This post is made possible with the generous sponsorship of Mr. Fusion - Home Energy Reactor.